317 pgs, 1961, Dover Publications Inc. Although this classic introduction to space-flight engineering was first published twenty-five years ago, not long after Sputnik was launched, the fundamental principles it elucidates are as valid today as then. 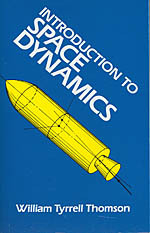 The problems to which these principles are applied have changed, and the widespread use of computers has accelerated problem-solving techniques, but this book is still a valuable basic text for advanced undergraduate and graduate student of aerospace engineering. Thomson has provided the mathematical tools that are required for quantitive analysis of the basic concepts of motion in outer space.